The list of one-word-birds is populated by two sorts of critters. There are the ones that are instantly familiar – like Mallard, Emu and Osprey – and the ones that aren’t. Many of the latter have names that may as well have been assembled from a random handful of Scrabble tiles. Be sure to keep Anianiau in mind next time you have a rack of vowels and want to score that all-important bingo. An ‘Anianiau, aka your new secret Scrabble weapon. I was admittedly surprised and a bit embarrassed by the number of birds on the list I’d never heard of, and after cherry-picking a bunch of easy ones to start I suddenly found that I needed to do a little reluctant research. So off to the internet I went, and after a short but productive stint on Wikipedia1 I found myself arriving at one inevitable conclusion: the Hawaiians are cheating. Of the 143 one-word-birds, an incredible 17 are endemic to Hawaii. That’s an astonishing 12% of all the one-word-birds in a state that has less than 0.02% of the world’s land area2. A grave injustice, to be sure. It may not be, however, that the Hawaiians are deliberately trying to hornswoggle the rest of us3. Instead it seems that they simply have a unique combination of advantages that qualify them for one-word-bird glory. Firstly, Hawaii is a remote group of islands and like many such islands it has a high level of endemism. This means the birds that have evolved there have done so in relative isolation, sadly without the option of traveling to neighbouring locales for a little foreign nookie. With no outside genetic input these birds have become unique to Hawaii, distinct from their mainland counterparts and found nowhere else in the world. Perhaps the most charismatic of the Hawaiians: the ‘I‘iwi. Because these 17 birds are only found in Hawaii they were not discovered and named anywhere else, and there are no naming conflicts to resolve. This allows their original Hawaiian names to stick, and brings us neatly to advantage number two: these Hawaiian birds were mostly named by Hawaiians, mostly in the Hawaiian language4. Now I will be the first to admit that I know nothing about the Hawaiian language, but as an outside observer it seems to me that it may suit one-word names particularly well. It’s also not spoken in very many places5 and there aren’t that many birds in Hawaii. As such not many birds have Hawaiian names, which means there’s little need to make numerous fine distinctions. There is one small caveat worth mentioning here, and it has to do with spelling. The Hawaiian language uses some interesting punctuation, specifically a glottal stop called an ‘okina (as in the word Hawai‘i, when spelled correctly in Hawaiian). 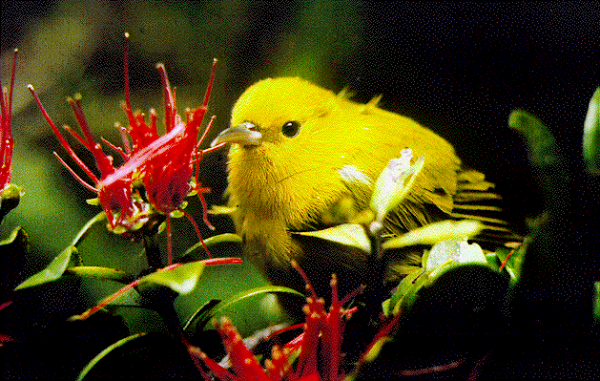 Many Hawaiian bird names contain an ‘okina, which appears to break the word into two parts, like a hyphen. Having decided early on that hyphens would disqualify potential one-word-birds, I worried briefly about how to handle this new and unexpected character. Fortunately my concern was short-lived, as a little more research presented the solution6. The ‘okina is actually a letter of the Hawaiian alphabet, and since letters are what words are made of, it surely leaves these one-word-names intact. Sadly, since the Clement’s checklist is not written in Hawaiian it leaves out the funky punctuation7 anyway, which does seem a bit of a loss. You can see this in the table below. The keen observer will notice a few other trends in the table. 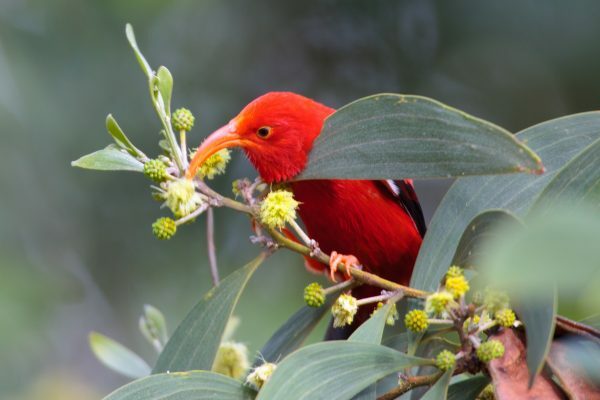 For one, it turns out that the Hawaiian one-word-birds are not diverse, with 10 of 17 species belonging in one particular group: the Hawaiian honeycreepers. This entire family of birds occurs only in Hawaii, and is not particularly like any other family of birds in the world. This strangeness is the Hawaiian birds’ third advantage. When English-speaking ornithologists first arrived in Hawaii, they would have been confronted with birds that looked unlike those they’d encountered anywhere else. In many cases it’s still not even entirely clear today how these Hawaiian birds are related to birds in other parts of the world. 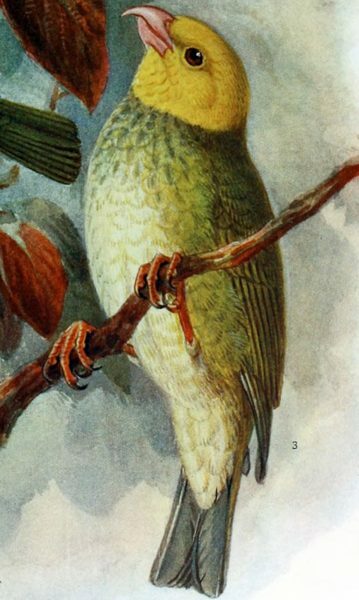 That makes assigning English names difficult – you can’t call something a Hawaiian Finch, for example, if you’re not even sure it’s a finch to begin with. For this reason it would have been easier to stick with the birds’ local names. I like to think there may even be a more romantic explanation for it, as the names are as strange and unfamiliar to English-speaking birders as the birds themselves. In any case the unusual mononyms persist, and Hawaii is the one-word-bird champ. Sadly the Aloha State may not reign forever, as many of its unusual birds are in critical danger. Four of its one-word-birds are already extinct (although they yet remain on the Clement’s checklist). There may be others too, including the bird with the shortest name of all: the Ou (‘Ō‘ū). The last confirmed sighting of this enigmatic creature was in 1989, and its continuing “critically endangered” status may simply be a case of wishful thinking. The enigmatic ‘Ō‘ū. Few, if any, photos of the living bird exist. As is often the case with island birds8, the threats they face are many. Avian malaria (introduced by invasive birds and mosquitoes) and habitat loss due to development are prime among them. There are several organizations working on bird conservation in Hawaii and lots of places to learn more – for those interested, the American Bird Conservancy may be a good place to start. At least for now Hawaii maintains its status as a one-word-bird superpower, and the best trip to plan if you’ve got some spare cash and want to add a bucketful of species to your one-word-birds life list. It may just come in handy during your next Scrabble tournament too. 1Obviously that’s where I do all the research for this blog. 2This calculation also comes from Wikipedia so you know it’s correct. 3Yes, I used a thesaurus. 4How Millerbird snuck in there I do not know. 6I think we all know where that research was performed. 7Hawaiian also uses the macron or kakakō.